Westminster Abbey at the end of the 2018 Commonwealth Day Service. can be seen in the back row of the choir stalls on the right. March 12th marked Commonwealth Day, and this year’s events were significant for Tristan in two ways. The retirement in 2017 of HRH the Duke of Edinburgh meant he wasn’t there to accompany the Queen for the annual Commonwealth service in Westminster Abbey. The Duke is the only living member of the royal family to have visited Tristan, and the island has sent him warm wishes for a happy and restful retirement. 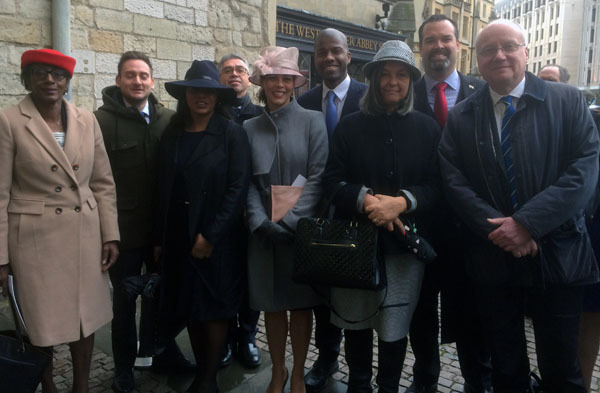 I was honoured to represent Tristan at this year’s service, which was attended by the Queen, Prince Charles and the Duchess of Cornwall, Prince William and the Duchess of Cambridge, and Prince Harry with his fiancée Meghan Markle (undertaking her first official engagement with the Queen). showing left to right, representatives from Montserrat, Falkland Islands, Bermuda, Gibraltar, Tuks and Caicos Islands, British Virgin Islands, St Helena, Cayman Islands, and, far right Tristan da Cunha. This year London will also host the Commonwealth Heads of Government Meeting. It will have a focus on the sustainable future of the world’s oceans. Tristan is playing a major part in the contribution of the UK realm to that agenda.